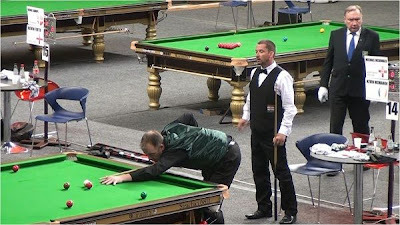 This evening all of the players, referees and volunteers attended the opening ceremony of the 2012 European Snooker Championship, also attended by dignitaries from Daugavpils in the impressive Olympic Sports Centre. It was great to once again meet up with friends of old, and make new acquaintances. Speeches were well received by all present, and the EBSA Chairman Jim Leacy pointed out during his contribution that in a way he had brought Snooker into the Olympics, and there is no doubt about it, this venue is fitting for an Olympian event. Slightly embarrassed with the role call when it came to Northern Ireland, it's unfortunate that there is only one competitor from our wee country this year to fly the flag for Northern Ireland, but that's the way it is. Speaking of which Simon...where is my Northern Ireland Flag? Only jesting buddy. Really though? So this year it's just me on my own. It would have been good to see my old sparing partner John McIntyre make an appearance, but it wasn't to be....that didn't stop us regaling stories of past events (John you have been missed, so many people asking about you) but that is for another time. A few early starts, but thankfully no 19:00 matches which I don't particularly like as it eats into most of your day and subsequently there is less time to explore this wonderful city. Its been a great day. The only negative was missing the 5/1 odds offered by renowned snooker coach PJ Nolan that the tournament would start proper with a 'miss-cue'...which it did. Kicking myself for that slip up, coaches really do no best.